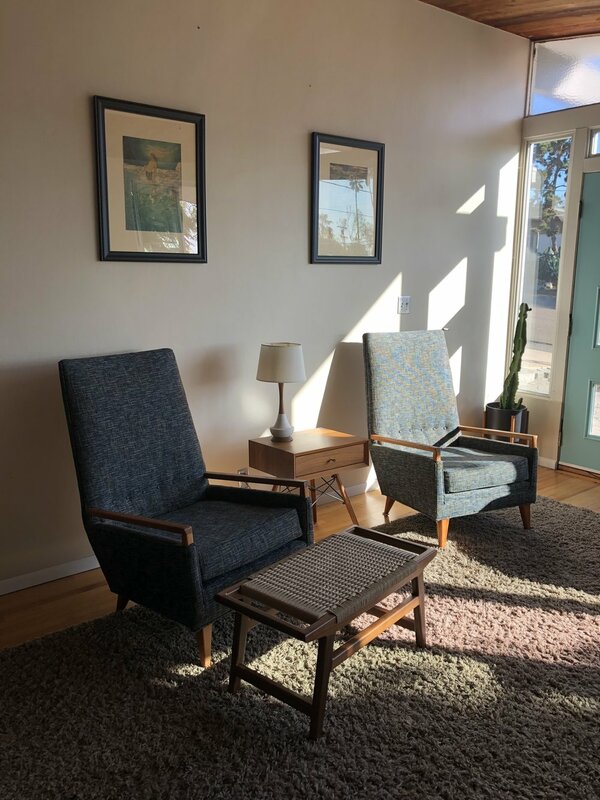 Custom furniture, woodworking, a little puppy wrangling and mid century modern aesthetics. As always, if you see something that you are interested in, please contact me. 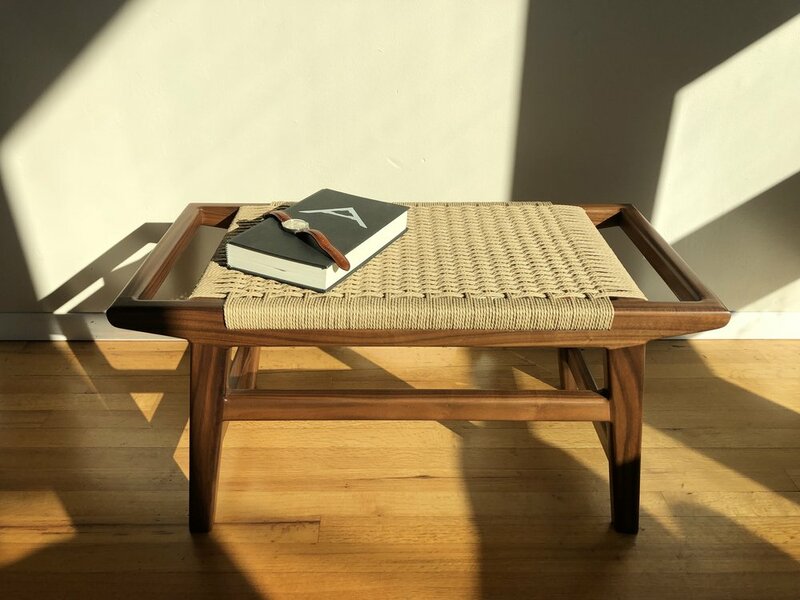 The Avery Footstool in solid walnut. 30”x15”x15”. 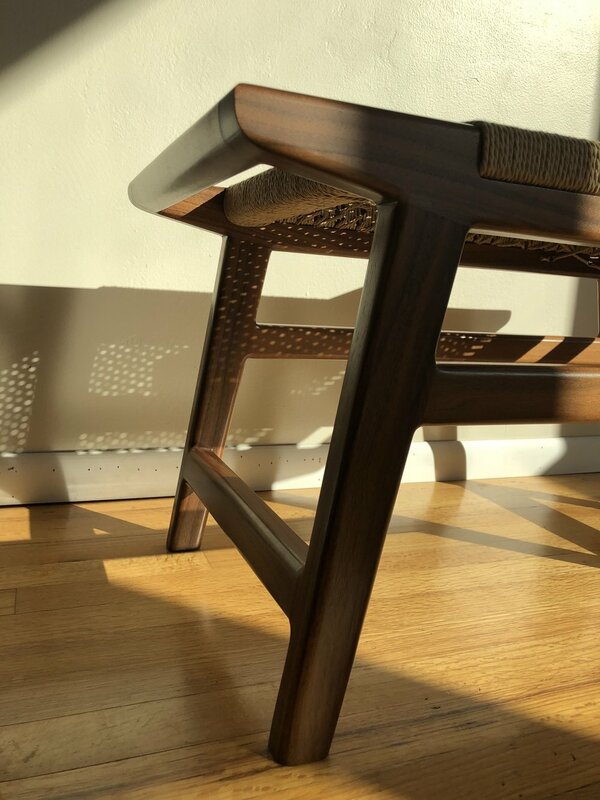 When I originally designed my MCM Bench I included these handles on the ends but haven’t included them until now. I think they fit the smaller proportions of this piece well. They are hand carved to match the end rails. This was a fun piece to build and I’m over moon with the final product. Thanks for checking in. Just delivered this Mid Century Bench to a great client. This turned out to be a very beautiful piece. 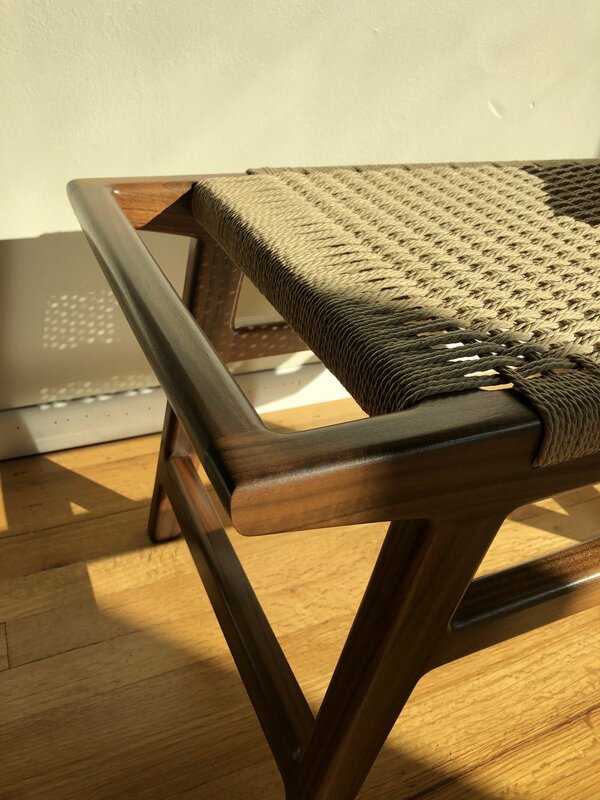 Solid walnut with a hand woven danish cord seat. Standard dimensions, 48x18x16. I have two more in production that will be done after a custom order. Look for them to be available this fall. Thanks for checking in. 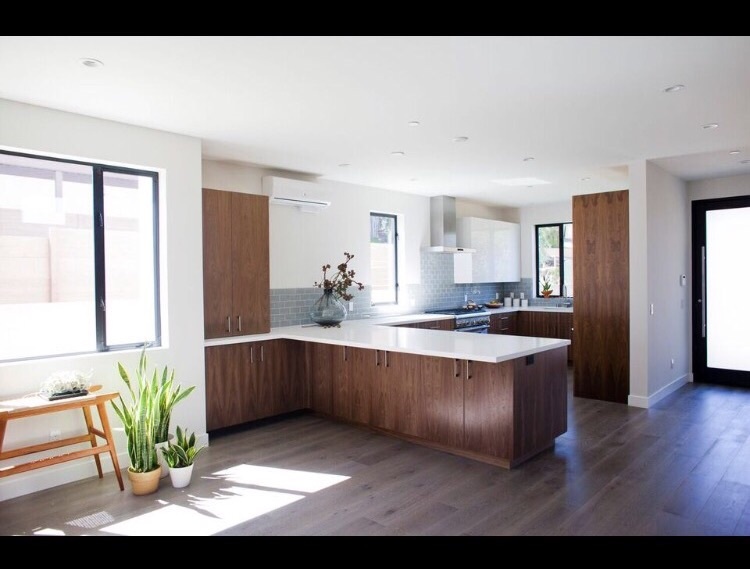 My Danish Cord Stool was recently featured in a custom home here in Cardiff by the Sea. My friend Cindy did all of the interior design and it came out great. When she asked if she could use some of my pieces I was stoked. Honored and stoked to be exhibiting my Mid Century Dresser at the Design in Wood Show at the San Diego County fair. Humbling and inspiring to show a piece of hand made furniture with some of the best in the country. "The 2016 Design in Wood Exhibition is co-sponsored by the San Diego County Fair 22nd District Agricultural Association, and the San Diego Fine Woodworkers Association (SDFWA). The talented, dedicated, and hardworking SDFWA members make this unique, popular, and award winning exhibition a success. Over 1,500,000 people are expected to visit the fair this year and this exhibit is the standout. Now the exhibition has national sponsors, gives out awards and over $20,000 in prizes to entries in 25 classes. The Design in Wood Exhibition, celebrating its 35th year, truly contributes joy, inspiration, recognition, and support to the community it serves." Just started this Mid Century Bench for Cyndi. 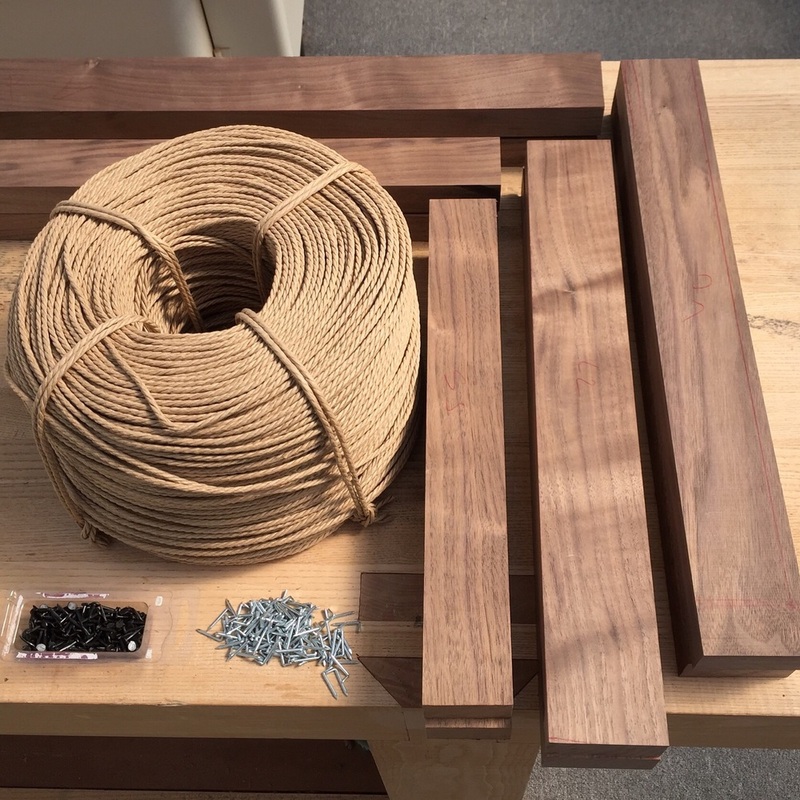 A fresh roll of Danish Cord, L Nails and some very nice walnut stock. Now that the stock is broken down into rough sizes it has to acclimate to the conditions here in my shop. After a week or more it will be ready to flatten and prepare for the joinery. Till then, thanks for checking in. 81 individual pieces, 9 glueups, 86 walnut pinned joints, Graduated drawers in American Black Cherry with undermount soft close slides, Black Walnut case, Highly figured Claro Walnut top and drawer fronts all came from one board. The highly figured Claro Walnut top and drawer fronts came from one piece that I had been saving for just the right project. These tiny chamfers are beautiful as they pick up the light but they are also functional; the edges are too sharp after hand tooling and can actually cut you. 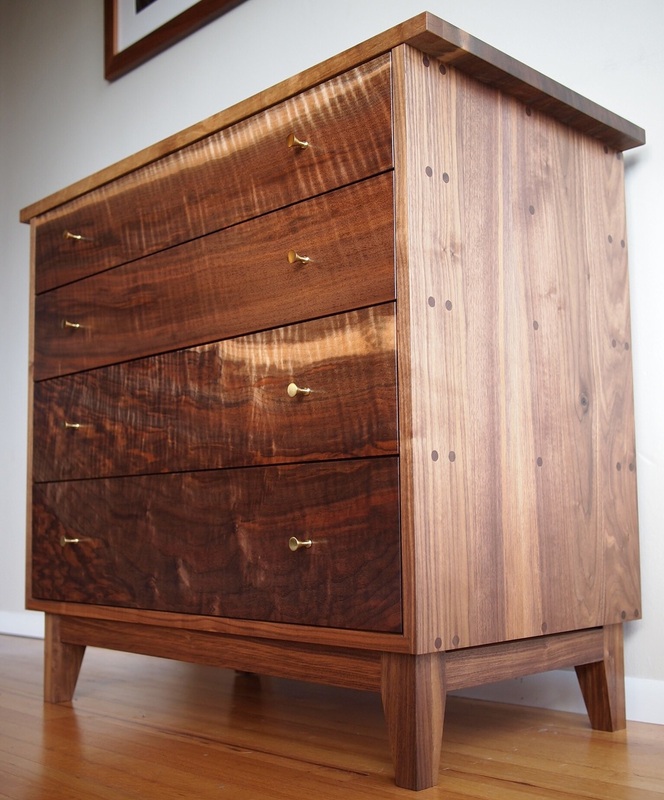 The Cherry drawers are pinned with Walnut dowels to match the patterning on the case. Got some pretty sweet hair pin legs in for a new table project. I recently picked up some very special lumber. I have plans to build our dining room table later in the year and I made the decision that this is the last table I'll ever own. I believe in making furniture that will outlast me and hopefully become heirlooms. To that end I searched high and low before I finally found Logs to Lumber. I've been casually looking for something special for about 6 months so when I found this set of 6 quarter sawn and book matched walnut boards I bought it immediately. 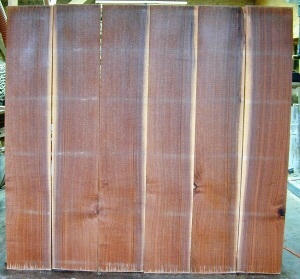 Being book matched means that they were milled from the log sequentially and will open like a book to match each face. This allows for a larger and more seamless appearance. Quarter sawing is a method by which the boards are sawn from the log with the annual rings mostly perpendicular to the faces. Quarter sawing yields boards with straight striped grain lines and greater stability than flatsawn wood - just what I want in a table. Nerdy wood speak aside this is pretty rare to find anymore and very special. With the recent fad of "slab" furniture (which I eagerly await the demise of) it's very exciting to find a sawyer with this level of talent and pride in his craft. 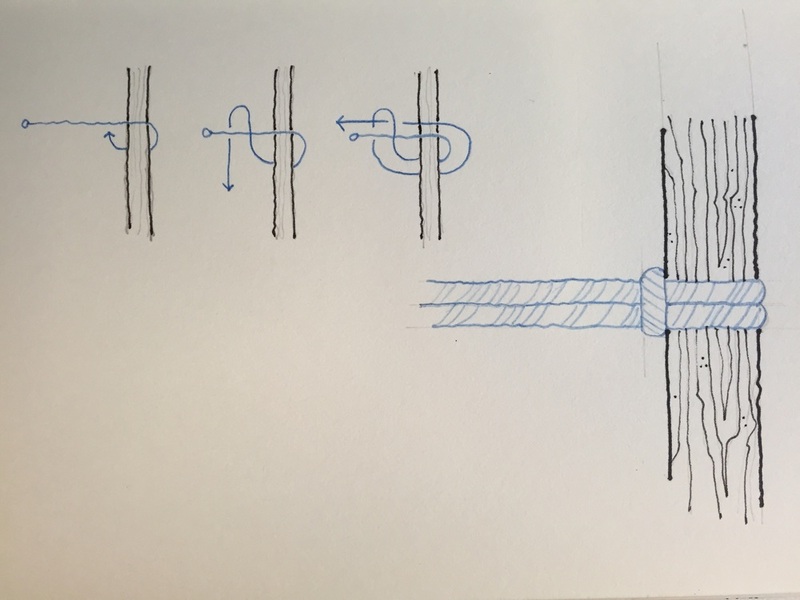 I have puzzled for hours on end trying to figure out a particular danish cord weaving technique and I think I've finally cracked it. To augment my MCM bench I have been designing a few chairs. I wanted a seat back with danish cord, but no visible nails - in keeping with my 360 degree visibility philosophy. This technique allows me to place the warp strands with no nails in the back, which means the chair will look great when pushed in at the table. As always I'm starting with this rough sketch, so now I can move to a real mock up. Thanks for checking in, real life mock ups to follow. 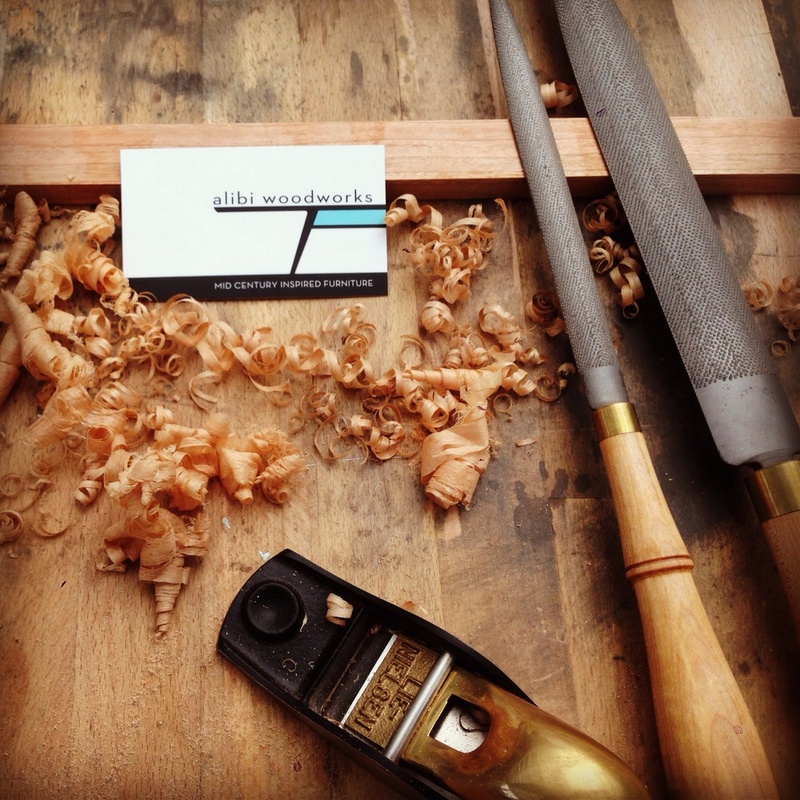 Hand carved spoons are super trendy in the woodworking world right now. So of course I made one. I can see the attraction, pretty fun really. I could see my scrap pile getting smaller. Chores are done. It's a very nice day for a few hours of hand tool work. I'm also working out designs for a few new projects that will be coming in 2015. My day job as a landscape architect has come home with me for an intense back yard renovation. As we move through renovating the house this has been a constant thorn in our side. After a long day of making furniture who wants to sit in a garden that looks like it belongs at Castle Greyskull? You can see our sweet fall down fence that was so termite infested that we would get woodpeckers pulling bugs out of it. Add in the incredible amount of concrete and terribly overgrown Birds of Paradise... Time for an update! So I set about removing the two Birds and dropped the old and nasty fence. Better already. Next up, we have to do something about all of this concrete. Water is precious here and I wanted to decrease our impervious area. I had the slab saw cut and most of it removed. The good news is 100% of the concrete went to a recycling facility to be made into more concrete. I moved the goofy half moon step and added a small wall to keep the grade at the original level. This is important because the view to the west (opposite the camera direction) is of the ocean. The photo below is from the day the concrete was poured, the gas fire pit is an integral color charcoal with matte finish. Trees. My favorite part. The boxed tree in the foreground is a Madrone (Arbutus 'Marina) and the tree behind it is a Cork Oak (Quercus suber). Cork oak are a pretty special tree. They are the only source of natural cork. Harvesting it causes no harm to the tree when it is peeled off from the trunk, making it a sustainable product. There is one more tree behind what looks like a giant cactus but is actually a Candelabra euphorbia. The tree in the way back is a Tipuana Tipu, a large fast growing tree that will give great afternoon shade. Beyond the fire pit area I have installed decomposed granite which will be the base for an artificial turf panel. The fire pit will get another layer of the decomposed granite, but in a nicer golden color. Its been a busy couple of weeks in the yard and it feels great to sit by the fire in the evenings. After I finish up the landscape side of things it will be time for some custom patio furniture. Thanks for looking. 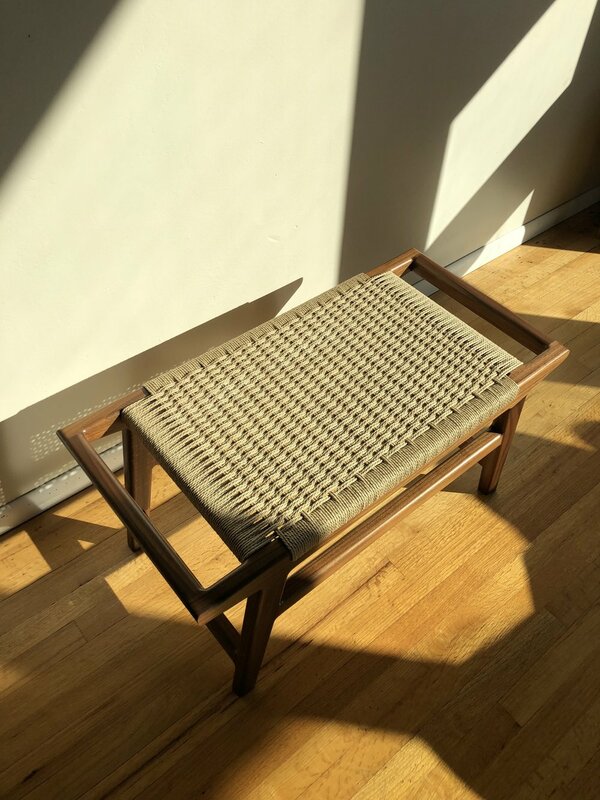 Just finished: Mid Century Bench in solid walnut with a hand woven danish cord seat. This bench is so great. 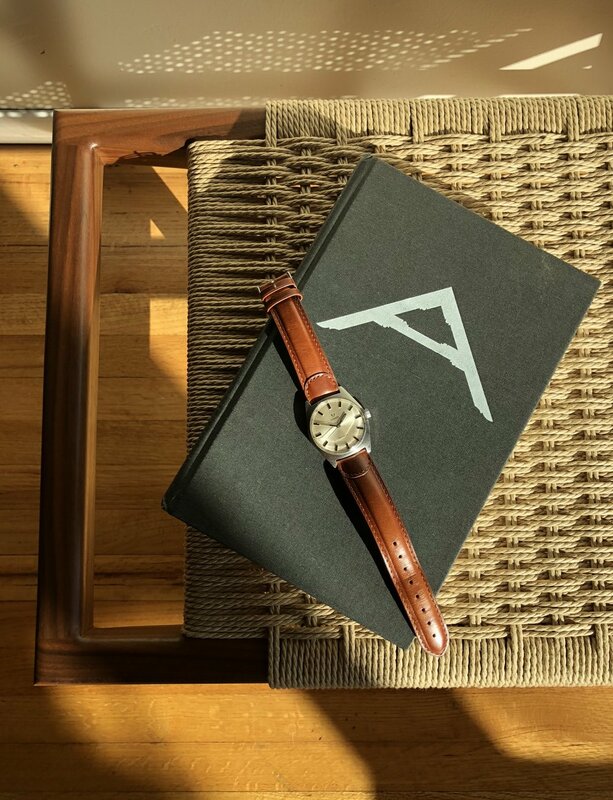 Designed and built by hand here in our sleepy little beach town, Cardiff by the Sea, California. Coming in at 48"x16"x18" this bench works great in an entry way or at the foot of a bed. This bench has been sold, but I would be happy to create a custom bench to meet your needs. Just drop me a line. 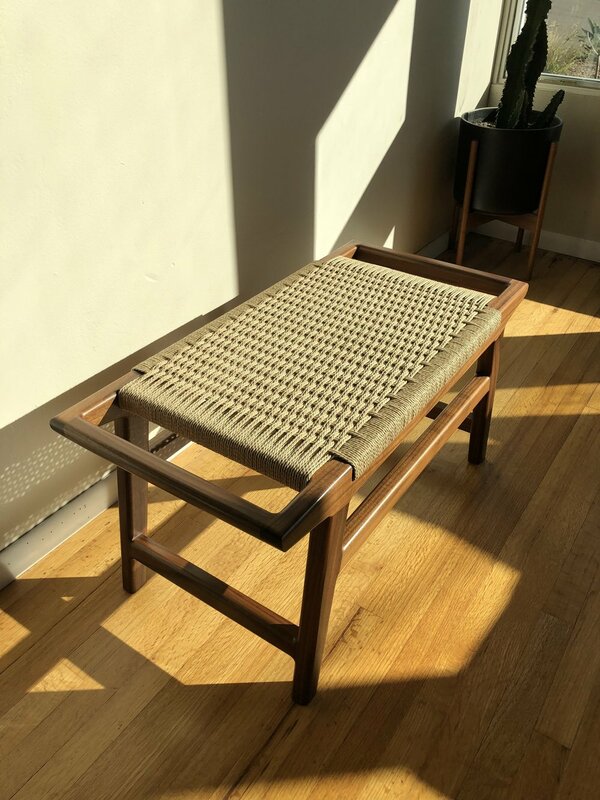 Drawing on all of the experiences of the Mid Century Stool, (here) this bench was a super fun build, looks beautiful and most important: it is functional in every day life. 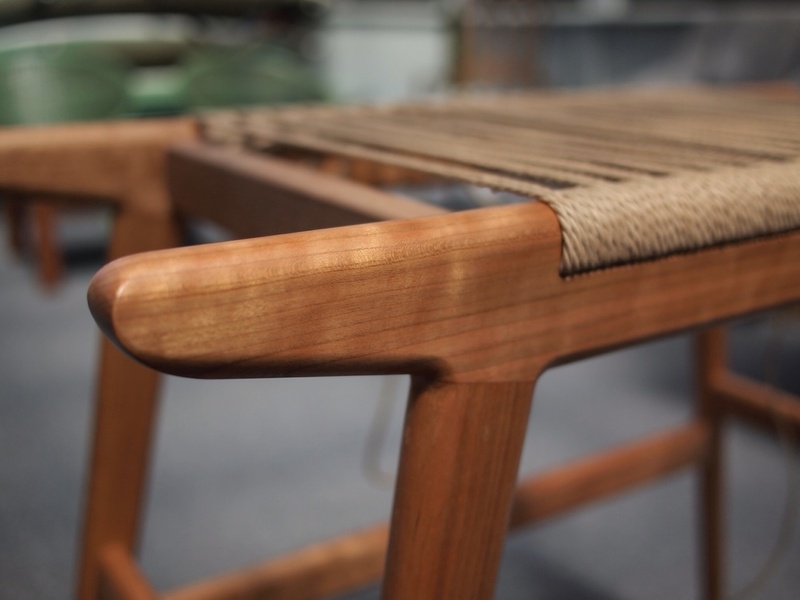 Above and Below: The signature horns on the ends of the bench are hand carved. It is the details like this grain wrapping through the radius that sets hand made furniture apart from the fray. Lots of L Nails to accept lots of weaving. This Danish Cord is a great contrast to the richness of the walnut, is an unbleached paper product and very sustainable. Leave a comment or drop me a line if you have any questions about this bench. Have a great week. A great weekend with a bunch of progress. The final coat of finish went on this solid walnut MCM bench. 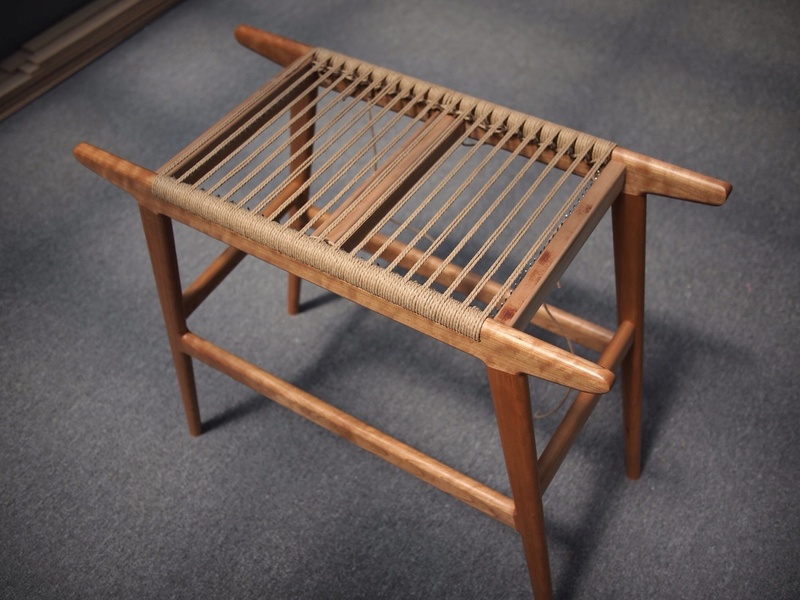 All of the Danish L-nails have been installed and the hand woven seat with Danish cord has begun. This bench is really going to be special. All of the joinery and materials are period correct and have come together to make a very nice piece of furniture. Should be done in a week with a full write up to follow. This part is so exciting; being close enough to see all of the design and building come together, but just enough left to do to anticipate the final form. Have a great week and check back for another materials update. After spending a fair few hours this weekend sanding, sanding, sanding the MCM Bench is ready for finish. The hand rubbed oil + varnish takes about 5 days so I should be weaving by the weekend. Nearly all of June found me on the road for the day job, so it's been great to get back into the shop. I've wanted all of the frames in our house to match for the longest time. Since I had to wait three weeks for a custom router bit for the MCM Bench I got after these frames. I added a mortise and tenon to all of the miters to strengthen the joint. This is just the first three. Six more in the works - why did I want all of these to match again? 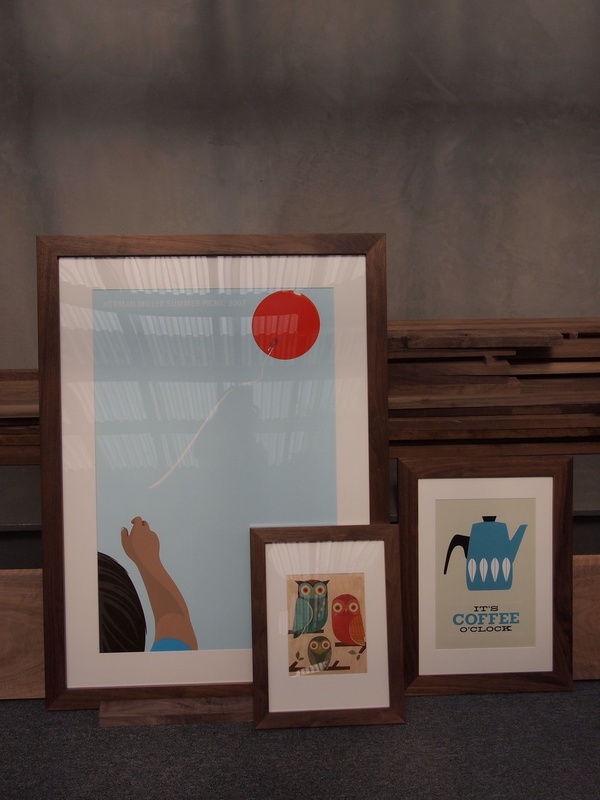 for scale: the Herman Miller picnic poster is 36x48 with frame and matte. This is a little teaser for the bench I am currently building. More to follow after the weekend. Enjoy! When we moved into the house, this bathroom had been shared by a group of college students for a few years and was...not real nice. In fact, I gutted it down to the studs before we ever showered in it. I generally try and demo as little as possible to reduce landfill contributions, but there were some pretty serious neglect problems. The good news is we had an opportunity to create some unique furniture. Sure, a bathroom vanity isn't always on the average list of definitions for furniture. In my house it sure is, though. I knew right away that I wanted it to take cues from a mid century modern credenza or dresser. I looked at all of the hyper modern manufacturers to see if I could save a little time and buy something. Nope. There is some good stuff out there, for sure. Just not what we were looking for. I took out a ridiculous faux oak, country styled vanity and created this custom vanity in its place. The exterior shell is all American Black Walnut ply. I used solid Black Walnut dowel legs to tie into the furniture in the other rooms in the house - they are typical for the period. Solid surface counter in white with a very minimal edge overhang. And this right here: this is where the real magic happens. This is the difference between a custom piece of hand made furniture and something you can buy off of the shelf. Whats the big deal? Context sensitive design, thats what. That sink up top drains through the P-trap in the wall below. That P-trap is a space killer in almost all vanities you can by at the big box retail stores. That is why you will see doors on so many vanities. They allow for room the plumbing. Unfortunately it is a huge waste of space. I solved this by making 2 half drawers in the center. This is much more efficient than a dark shelf that you have to bend over to find. All drawers use soft close Knape Vogt Slides. I grain matched the drawers for a clean, modern and consistent look. About those drawer pulls. If this wasn't for our house they would be the typical chrome or stainless steel. But, because we live close to the ocean we give a few subtle nods to the beach life, like these hand painted urchin knobs. The tiles are 12x24 Marazzi Italian, high recycled content, linen texture. Unfortunately, they stopped making them. I liked them so much that I had planned to use them in the kitchen, which will soon be remodeled too. Octopus towel hanger guy is happy. Thanks for checking in! Mid Century Bench is done! Feels great, too. This was a fun project from start to finish with no shortage of surprises in between. I knew that this was going to be a prototype so I ventured away from my beloved Walnut and chose American Black Cherry for this build. In the photo above all of the pieces are rough cut per my plans and I am four-squaring the lumber. That is, making it perfectly square in all 3 dimensions. Nerdy wood speak aside, that just means no goofy surprises down the road. 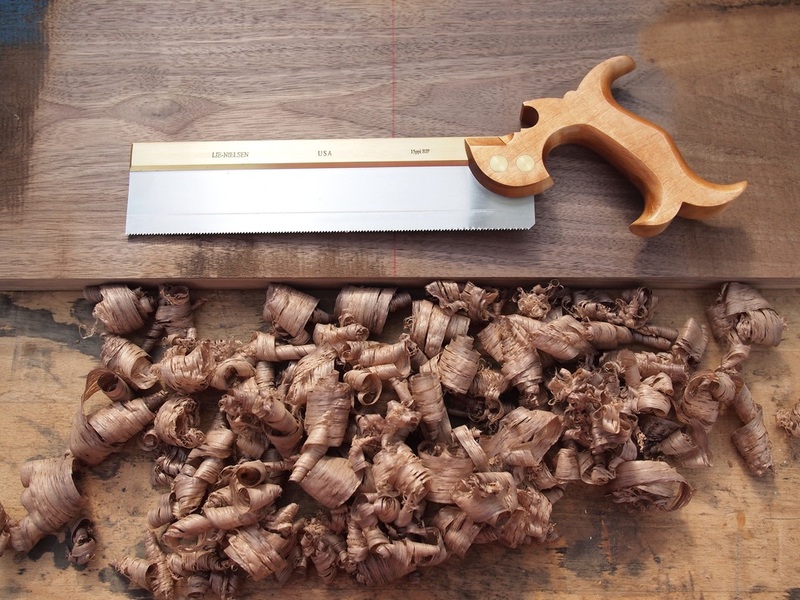 Here you can see I have cut the legs both to finished length and also with a taper to them. There is also a taper on the seat rail that will later form the signature horn on the seat. Every single joint on the stool is a mortise and tenon joint, hence the holes in the ends. Traditional, strong, real. The shot above shows the groove routed through each seat rail to later accept the Danish Cord. Also, the angle on the horn section of the seat rail creates the splay in the legs, which further sets off the taper. Now we are starting to have fun. In the early stages you really have to trust your design because, frankly, it is a little funny looking. When you start breaking down the hard edges and thinking about running your hand over a piece of furniture, it really starts coming together. After all of the joints are rounded over and fared together all of the pieces get three coats of an oil + varnish mixture with sanding in between each coat. It takes about 3-5 days but it is worth the effort. The Weave. Danish Cord is an unbleached paper product, wrapped in three strands just like a jute or cotton twine. Because it is a paper product it is actually pretty sustainable, it lasts for a long time and is pretty easy to replace. That said, it is a ton of work to weave a seat. Hats off to the professional seat weavers out there. Above and below I've just finished the warp strands of the weave. This is the 50% mark. The Danish Cord gets hooked onto the Danish L Nails that are seen here. After all of the warp strands come the weave strands. These are left to right. They are also much easier, but this is offset by the fact that there are so many. In the end, it is very comfortable and creates a unique texture. The contrast of the cord with the Cherry is very nice. Cherry darkens over time as it is exposed to UV light, so this should age nicely. Overall, I'm real happy with the stool. I originally designed and built this to use at my work bench when I am using hand tools. I could easily see modifying the dimensions to be taller and narrower to fit as a bar or kitchen nook stool. Thanks for checking in. I will be in Palm Springs all week for a day job conference. Enjoy! Fisrt half of the Danish cord weave is complete. Thankfully the second half is much easier - my hands are pretty chewed up. This little stool is going to give my bum a place to rest when I'm using hand tools at my workbench. the Danish cord sets off the Cherry nicely. I plan to do a more in depth write up when it's all finished, enjoy the rest of the weekend! What a week it has been. Parts of the site are offline and being recreated - bear with me on that. I've got some new content in the works. In the positive side, new business cards. The front, shown here with my Auriou Rasps, came out great. I'll post the other side later this afternoon. I'm real pumped on them. As someone who makes objects I still get excited about analog things. If you made an order, I'm on it this weekend. Enjoy yourselves!